Make art that’s out of this world with clever use of blend modes and some of Photoshop’s lesser-spotted filters. Given the right photography, then, any half-competent designer could knock up a perfectly adequate space movie poster design in minutes. The only problem is that, as it’s in space – and therefore impossible – such photos don’t exist. 01. 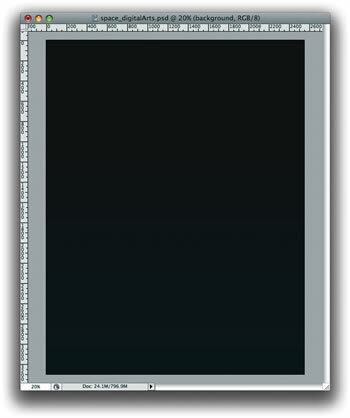 Create a new portrait document in Photoshop; I’ve used the standard A4 size (210mm-x-297mm). Select the background layer and go to Layer > Layer Style > Gradient Overlay; create a gradient using very dark blue colours (if you want to use the same shades I’ve used, click on the foreground colour swatch in the toolbar and enter reference numbers #070805 and #030d19 in the bar at the bottom), with the style set to Linear and the angle set to 90º. 02. Create a new layer, naming it ‘Aurora’, and select Filter > Render > Clouds; setting black and white for the background and foreground colours. Next, select Edit > Transform > Distort, and change the perspective for the distortion, making the top part larger (see above). Change the Blend Mode to Color Dodge and the Opacity to 50%. Then select Layer > Layer Styles > Gradient Overlay. 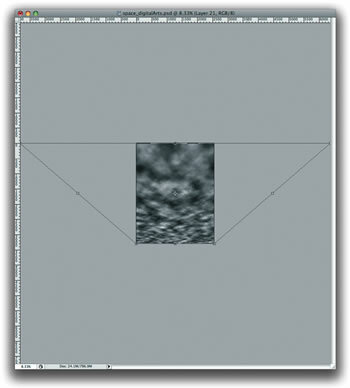 Change the blend mode to Multiply, the style to Linear and the angle to 90º. For the colours use Orange (reference #fba46f), Pink (#cb8cd4), and Blue (#346777). 03. Next, let’s place our hero in the poster. I used an image of a construction worker from free image site sxc.hu; it can be downloaded from http://tinyurl.com/6qc4jj. A similar silhouetted figure will also work. 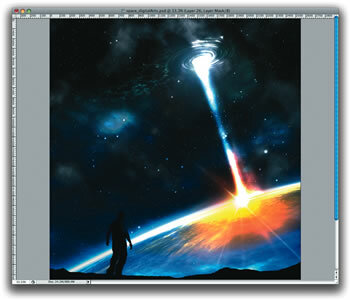 Extract the figure from the background using the Lasso tool (L) or the Pen tool (P) to create a path. The image has a reddish colour palette, which we’ll turn to blue: select Image > Adjustments > Hue/ Saturation. 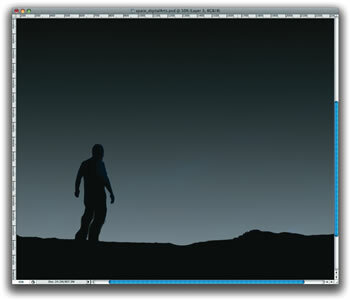 Adjust the Hue value until you get a nice blue tone, reduce the Saturation and make it darker by reducing the Lightness. 04. 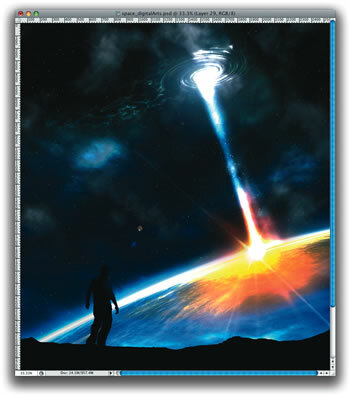 Create a terrain for the man to stand on using the Pen tool. The black of the terrain will go all the way to the bottom of the image; we’ll use this space for text later on. Group the ‘Hero’ layer with the ‘Terrain’ layer and place them on top of the other layers. Next, add a new layer, filling it with a Linear Gradient from white to black, selecting Color Dodge and an opacity of 80%. This layer will be above the ‘Aurora’ layer. 05. Now we’re going to bring in the planet. I’ve used another stock image that can be downloaded from http://tinyurl.com/69npcb, or use a similar image of your own. 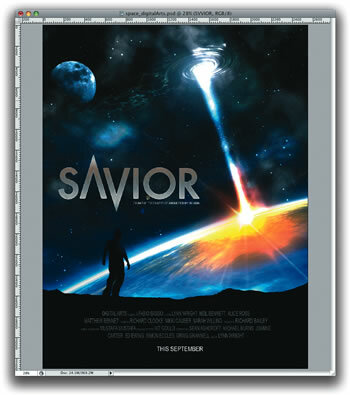 Place the image on your design, beneath the ‘Hero’ layer group. Change the blend mode to Screen and the opacity to 100%. You’ll notice that the earth is slightly dark: to change, that, create a new layer, fill it with black and change the blend mode to Color Dodge. Then select the Brush tool (B) and, with a soft brush, paint white over some areas to make the earth shinier. 06. Add a new layer, and select Filter > Render > Clouds. Make sure you have black and white for the background and foreground colours respectively. Change the blend mode to Color Dodge, then select the Eraser tool (E), and use a large, soft brush with the hardness set to 0%. 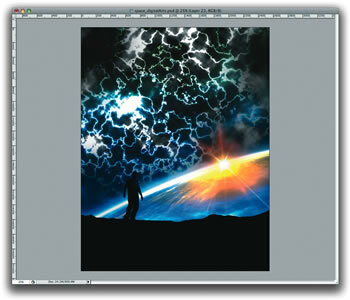 Brush over the parts you don’t want to appear on the final image, then duplicate this layer twice. 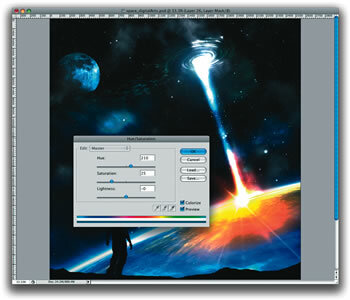 In the third copy, select Image > Adjustments > Invert, and change the blend mode to Lighten. Use the Eraser tool again to adjust some areas. 07. In a new layer, select Filter > Render > Clouds again, making sure that the clouds are black and white. 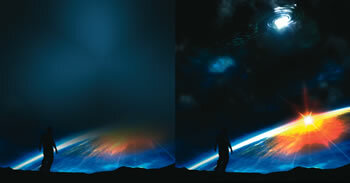 Then go to Filter > Render > Difference Clouds and then Image > Adjustments > Invert. Change the blend mode to Color Dodge and then Image > Adjustments > Levels. Increase the quantity of black and greys (I used 91, 0.46 and 255 for the values): this will create a good lightning effect. Next, go to Filter > Blur > Gaussian Blur, changing the Radius to 5.5. Use the Eraser tool to delete parts of the layer again. 08. 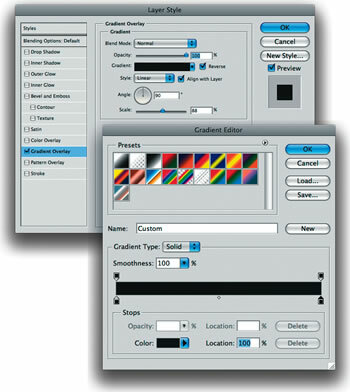 With the Elliptical Marquee Tool (M), change the Feather option to 30 pixels and create a elliptical selection as shown here. Go to Filter > Distort > Twirl. The values will depend on your image, so increase the values until you get a nice twirl. Next, select Edit > Transform > Distort and distort the layer to create a perspective pointing to the earth and to the sunlight. 09. Create a new layer filled with black. 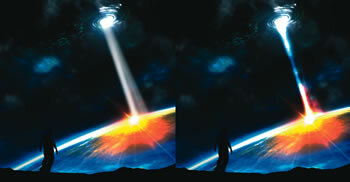 Go to Filter > Render > Lens Flare. Use Brightness 110% and for the lens type use 105mm Prime. 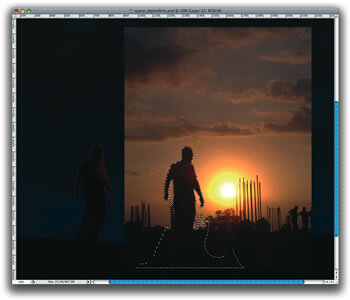 Change the blend mode to Linear Dodge, and resize the layer to make the spotlight fit in the centre of the twirl. You will have to make this layer a bit darker, so select Image > Adjustments > Levels and increase the black by moving the left-hand slider. 10. Again, create a new layer and fill it with black. Select the Brush tool (B), change the Hardness to 0% and use a large size. Select a blue colour (#5a708e) and paint some areas, mainly in the centre and close to the light areas. Then change the blend mode to Soft Light. You will notice that the clouds will get a bit darker and bluer. 11. 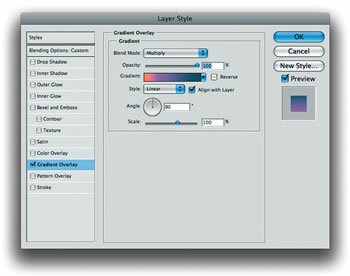 Create a new folder in the Layers palette, and create a new layer in it. Select the Brush tool again with a very soft brush, and use this to create a straight line in white: click on the start point, then hold Shift and click on the end point. Reduce the brush’s opacity to 50% and reduce its size, then create another line next to the previous one. Repeat this again, to create another line, as here. 12. Let’s create the stars. We’ll create two kinds of stars: very small ones and some big ones. For the small ones, create a new layer on top of the space layers, fill it with black and change the blend mode to Screen. Select Filter > Pixelate > Mezzotint. 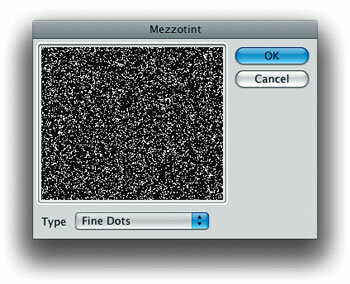 Set the type to Fine Dots. Then go to Filter > Blur > Gaussian Blur, setting a radius of 1 pixel. Next, select Image > Adjustments > Levels and increase the values to make the image darker and the whites brighter. I used 125, 1.00, and 211 respectively for the values. 13. 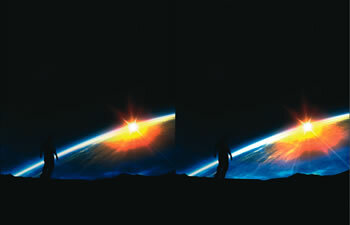 To create the big stars, we’ll use the Brush Engine. 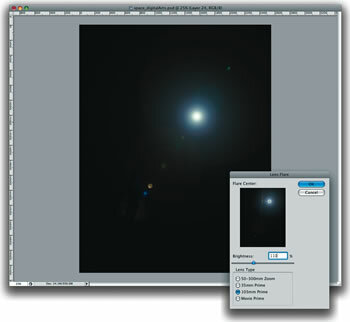 Create a folder, name it ‘Big Stars’ and change the blend mode to Color Dodge. 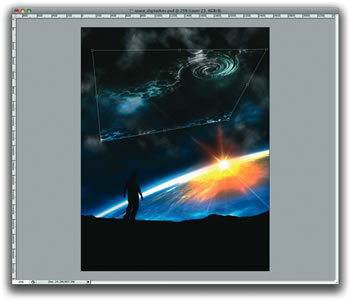 Inside this folder, create a new layer and select the Brush tool; go to Window > Brushes. 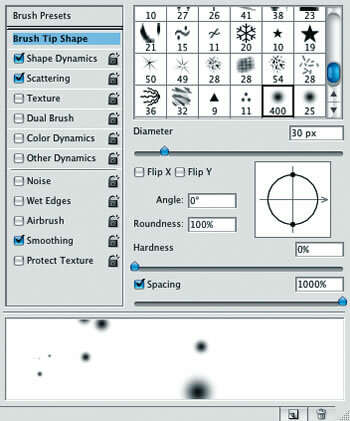 In the Brush Tip Preset, select an elliptical brush with a diameter of 30 pixels, hardness of 0%, and spacing to 1000%. In the Shape Dynamics change the Size Jitter to 60%. Select Scattering and change the Scatter to 990%, select the Both Axes option. Change the Count to 2 and the Count Jitter to 70%. Now paint stars in your space. 14. Now let’s add a moon to our scene. I used another stock image http://tinyurl.com/6opevz, but you can use any moon photo you have to hand. Place the moon image in your design, and rotate it so that its brightest part points towards the twirl. Select Image > Adjustments > Hue/Saturation, change the Hue value to make the moon blue, and reduce the Saturation. I used 210 for the Hue, and 25 for the Saturation. However, this value may vary so try different values. Next, change the blend mode to Color Dodge. Duplicate the layer and go to Filter > Blur > Gaussian Blur, use 10 pixels for the Radius. Change the blend mode to Screen and the opacity to 8%. This layer has to be beneath the other moon, and set to Color Dodge. 15. Now let’s add the title. 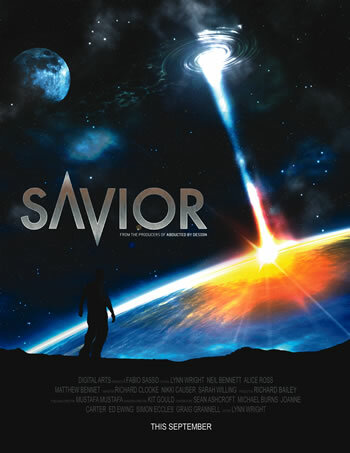 This film will be called Savior. 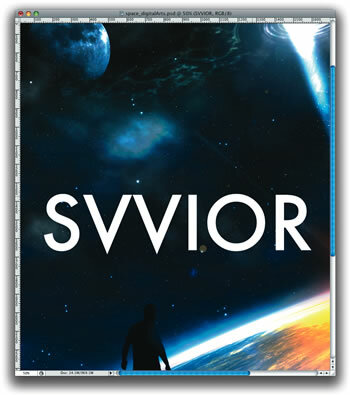 Choose Futura as the font and instead of typing Savior, type Svvior, then flip the first ‘V’ to create a futuristic-looking ‘A’. Also, make the heights of the A and V much bigger, so that the A stretches upwards and the V points to our hero. Next apply some layer styles. Go to Layer > Layer Styles and choose Gradient Overlay. Create a gradient through grey, white, brown and white. Set it to Linear and at an angle of 90º. Also, add a Pattern Overlay, using a texture that resembles metal. Then add a Gradient Stroke, again using grey, white, grey and white. Use 90º for the angle and three pixels for the size. Finally, select Outer Glow, use Color Dodge for the blend mode with white for the colour. 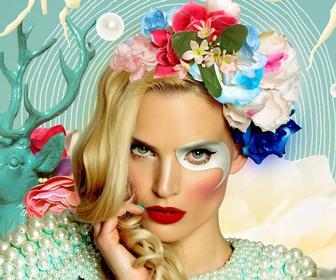 Set 95% for the opacity, 10% spread, a size of 40 pixels and a range of 60%. 16. Finally, place some more text, movie-poster style, and make any final adjustments you see fit. When creating the rays of light in Step 11, rotate the layer to make the ray start from the centre of the twirl, and end in the sunlight – this will make it look like an explosion. 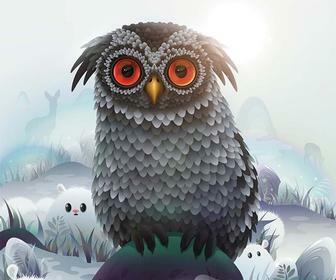 Who: Based in Porto Alegre, Brazil, Fabio Sasso is a graphic and Web designer. 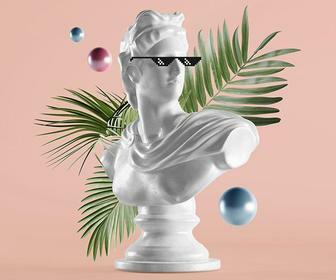 As well as running Zee, a small Web-design studio, Fabio has a creative arts blog, Abduzeedo, which he uses for tutorials, experiments, and articles about Photoshop, Illustrator and other creative applications.